Lobby of the store in the lower level of Manhattan Mall, looking very glam. JCPenney Manhattan Mall and People Style Watch hosted "Miss for a Must" on Fashion's Night Out last week. Guests traded in a fashion "miss" for a $25 gift card to put towards a fashion "must," and I took mine straight to MNG by Mango and I Heart Ronson. As usual, JCPenney held one of my favorite events during an event-packed evening. There's always great food, drinks, and fabulous attendees like the Olsen twins, designers of Olsenboye, and Charlotte Ronson, designer of I Heart Ronson. Here I am in my "must," a MNG by Mango scarf (shout-out to Midtown Girl and John Simon of JSD for shopping assistance and all-around fun), and here's a model in a fabulous MNG by Mango maxi dress that I must have. 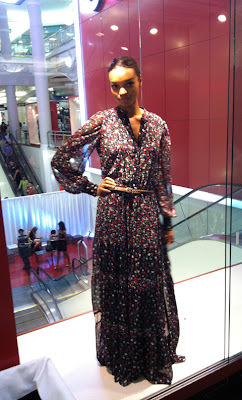 In case you missed my FNO post, another shot of me! Note the plethora of single-arm-on-waist poses, the classic standby if you're not up for the more challenging Olsen Twin arms-hanging-along -sides pose. I had the pleasure of seeing the maxi dress yesterday evening on an attendee at the Alice + Olivia show, and it looked just as fabulous IRL (meaning not on a professional model). Buy it soon, this one's selling out fast.